Honoring Elders for their Lives and their Wisdom. 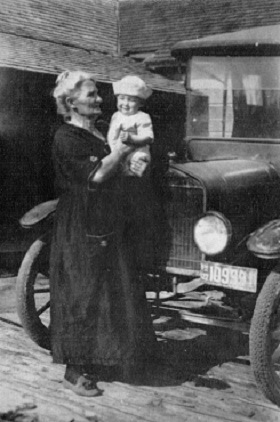 (Top) DeEtte William "Bill" Broderson, (Bottom) Carrie Broderson holding DeEtte William Broderson. His Twiggs grandparents had a farm at Port Ludlow or Beaver Valley and from there they moved to Irondale. After Irondale they moved to the “rock” at Chimacum where he used to visit them. “You can see the rock from Chimacum School. It’s a big rock.” They used to go to school with some of the Patsys. The next move was to “remote Eaglemount so he (father) could bootleg. They made a little moonshine in Irondale but it wasn’t too good a place there, too many people.” They had a few cows, two horses, a couple race horses too, and sold sour cream there. The next move, in 1928 when he was seven-and-a-half years old, was to Center where he attended school in Chimacum and finished high school there. He lived six miles from the school and went to school on a bus that was open and had no windows, just shades that rolled up and down. At Center “I used to have to milk cows and everything there was to do on the farm” including gardening. Out in the woods he picked wild blackberries. He and his friend, Matt Lorenzen, made a dugout canoe when he was about twelve. They wanted a place where they could use it so they dammed up the creek to go swimming and use the little dugout they made. “When we dammed the creek up it broke loose and took the neighbors milk out they had in the creek to keep it cool.” It was in ten gallon milk cans. Bill tells about one time when he was twelve when the folks were gone. They had a little yearling calf and an old buggy. “We put a sack over its head so it wouldn’t get excited and hitched it up to the buggy. Then we pulled the sack off and jumped in the buggy and a way we went down the hill, around the barn and we fell off. The cow hit the barn with her head and knocked her out. We thought we killed it. Finally it got up.” The folks never knew. When Bill was a teenager, he was a baseball pitcher and “fanned out” nineteen batters one day in a game with Port Townsend. 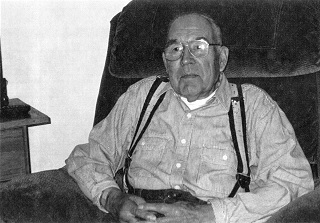 Bill Broderson passed away in 2007. 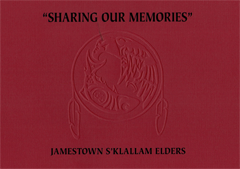 Jamestown Elders featured in this Exhibit. The House of Seven Generations was developed by the Jamestown S'Klallam Tribe and made possible by a grant from the Institute of Museum and Library Services.